Aortic valve stenosis (AS) is a disease of the heart valves in which the opening of the aortic valve is narrowed. The aortic valve is the valve located between the left ventricle of the heart and the aorta, the largest artery in the body which carries the entire output of blood to the systemic circulation. Aortic stenosis is now the most common valvular heart disease in the Western World. Symptoms related to aortic stenosis depend on the degree of valve stenosis. Most people with mild to moderate aortic stenosis are asymptomatic. Symptoms usually present in individuals with severe aortic stenosis, though they may occur in those with mild to moderate aortic stenosis as well. The three cardinal symptoms of aortic stenosis are syncope, anginal chest pain and dyspnea or other symptoms of heart failure such as orthopnea, exertional dyspnea, paroxysmal nocturnal dyspnea, or pedal edema. Angina in the setting of heart failure also increases the risk of death. In patients with angina, the 5 year mortality rate is 50%, if the aortic valve is not replaced. Angina in the setting of AS is secondary to the left ventricular hypertrophy (LVH) that is caused by the constant production of increased pressure required to overcome the pressure gradient caused by the AS. While the myocardium (i.e., heart muscle) of the LV gets thicker, the arteries that supply the muscle do not get significantly longer or bigger, so the muscle may become ischemic (i.e., does not receive an adequate blood supply). The ischemia may first be evident during exercise, when the heart muscle requires increased blood supply to compensate for the increased workload. The individual may complain of exertional angina. At this stage, a stress test with imaging may be suggestive of ischemia. Eventually, however, the cardiac muscle will require more blood supply at rest than can be supplied by the coronary artery branches. At this point there may be signs of ventricular strain pattern (ST segment depression and T wave inversion) on the EKG, suggesting subendocardial ischemia. The subendocardium is the region that becomes ischemic because it is the most distant from the epicardial coronary arteries. Syncope (fainting spells) from aortic valve stenosis is usually exertional. 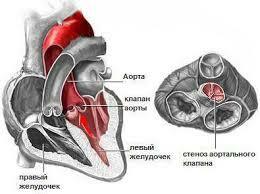 In the setting of heart failure it increases the risk of death. In patients with syncope, the 3 year mortality rate is 50%, if the aortic valve is not replaced. It is unclear why aortic stenosis causes syncope. One popular theory is that severe AS produces a nearly fixed cardiac output. When the patient exercises, their peripheral vascular resistance will decrease as the blood vessels of the skeletal muscles dilate to allow the muscles to receive more blood to allow them to do more work. This decrease in peripheral vascular resistance is normally compensated for by an increase in the cardiac output. Since patients with severe AS cannot increase their cardiac output, the blood pressure falls and the patient will syncopize due to decreased blood perfusion to the brain. A second theory as to why syncope may occur in AS is that during exercise, the high pressures generated in the hypertrophied LV cause a vasodepressor response, which causes a secondary peripheral vasodilation that, in turn, causes decreased blood flow to the brain resulting in loss of consciousness. Indeed, in aortic stenosis, because of the fixed obstruction to bloodflow out from the heart, it may be impossible for the heart to increase its output to offset peripheral vasodilation. A third mechanism may sometimes be operative. Due to the hypertrophy of the left ventricle in aortic stenosis, including the consequent inability of the coronary arteries to adequately supply blood to the myocardium (see "Angina" below), arrhythmias may develop. These can lead tosyncope. Finally, in calcific aortic stenosis at least, the calcification in and around the aortic valve can progress and extend to involve the electrical conduction system of the heart. If that occurs, the result may be heart block - a potentially lethal condition of which syncope may be a symptom. Congestive heart failure (CHF) carries a grave prognosis in patients with AS. Patients with CHF attributable to AS have a 2 year mortality rate of 50% if the aortic valve is not replaced. CHF in the setting of AS is due to a combination ofleft ventricular hypertrophy with fibrosis, systolic dysfunction (a decrease in the ejection fraction) and diastolic dysfunction (elevated filling pressure of the LV). In Heyde's syndrome, aortic stenosis is associated with gastrointestinal bleeding due to angiodysplasia of the colon. Recent research has shown that the stenosis causes a form of von Willebrand disease by breaking down its associatedcoagulation factor (factor VIII-associated antigen, also called von Willebrand factor), due to increased turbulence around the stenosed valve. Notwithstanding the foregoing, the American Heart Association has recently changed its recommendations regarding antibiotic prophylaxis for endocarditis. Specifically, as of 2007, it is recommended that such prophylaxis be limited only to those with prosthetic heart valves, those with previous episode(s) of endocarditis, and those with certain types of congenital heart disease. Since the stenosed aortic valve may limit the heart's output, people with aortic stenosis are at risk of syncope and dangerously low blood pressure should they use any of a number of medications for cardiovascular diseases that often coexist with aortic stenosis. Examples include nitroglycerin, nitrates, ACE inhibitors, terazosin (Hytrin), and hydralazine. Note that all of these substances lead to peripheral vasodilation. Under normal circumstances, in the absence of aortic stenosis, the heart is able to increase its output and thereby offset the effect of the dilated blood vessels. In some cases of aortic stenosis, however, due to the obstruction of blood flow out of the heart caused by the stenosed aortic valve, cardiac output cannot be increased. Low blood pressure or syncope may ensue.